When God gives you something, your first responsibility is to find a use for it – for the sake of His kingdom. If you have a car, you help people get to where they need to go. If you have time, you help those without any. If you have a house, you provide a roof for those who need it. Everything we have is for God, His glory and His kingdom. But, there are times when God has given you something that you don’t know what to do with. If you’ve asked God for what to do, and He doesn’t tell you… there’s only one thing to do. And, that goes for survival situations. There is a good chance that many of you have money in the bank. Hopefully, you’ve been tithing to your church. Hopefully, you’ve been using your money to meet the needs of others – especially, brothers and sisters in Christ. Hopefully, you’ve been seeking the Lord to use that money for His sake, and not yours. If you have not been doing that… well, I think that we’ll hafta stop here. If you have not been giving a portion of your earnings to your church, then you must not think much of your church. If that’s the case, find a new church until you CAN give to your church. Unfortunately, the problem might not be with your church. The problem might be with you. If you have been ‘holding out’ on God and not giving that minimum tithe to your church… or, at least giving it to something that is truly of God… then, you are holding back on God. If that is you, I am witness to the fact that God is holding back on you. The only way that we are going to survive what is coming is if we are truly and whole-heartedly in God’s hands. If you aren’t completely and utterly trusting God for everything, then you aren’t going to make it. It’s that simple. You’re money isn’t going to save you. God is going to save you. If you can’t see that, then there’s nothing that I can do for you. None of the advice that I’ve offered you so far will do you any good. I’m sorry. Start now. I don’t know how much time we have, so you must begin immediately. Get close to God. Help those who need help. Tithe to your church. Open your heart to God. If you’re still reading this, you have my respect and admiration. Keep up the good work. If you are doing all that, and you STILL have extra resources, then you have been given the job of being a good steward. You have the awesome responsibility of making sure that God’s resources (i.e., what you have) are ready for His work at the time and place that He wants them used. Let’s look into how to do that. If God has given you something valuable to hold onto (at least until it’s needed), you have the responsibility to NOT LOSE IT. What is the first principle of investing? What is one of the most important principles for surviving a disaster? They are failing. They are going to collapse. Any money that you have in the bank is going to disappear. Period. YOU. MUST. GET. YOUR. MONEY. OUT. I cannot tell you exactly when the crash is going to happen. No one can say exactly. BUT, it is horrifyingly close, and most of us are surprised that it hasn’t happened already. And, once it starts, it will be too late to save what you have. Bank failures and financial resets always, ALWAYS happen in the wee hours of the night. The day before will be financial sweetness and light, and the morning after will be complete devastation. Do not get caught by this. Now, I haven’t forgotten that this is an article about preparing for disaster. And, just as the need for food, water and security will differ according to your situation, the same is true here. If you know that you are in a really safe place and able to ride out the coming social upheavals in the comfort of your home, then your options are wide open. However, if you know that you’re going to need to make a run for safety, you are extremely limited in what you can do. So, you made the right decision and located yourself properly and securely. You are sitting pretty out in The American Redoubt. You cannot imagine any scenario that would require you to leave your home. If that’s you, then the world is your oyster. You can invest in anything of value. Buy a farm. Buy old cars and fix ‘em up. Become an inn-keeper. Get sheep. You have lots of options. Go for it. We will probably only escape this disaster with what we can carry – especially those of us who live in (or near) a city. And, if our financial resources need to fit in our backpacks… We are stuck with some pretty limited options. Please remember that we are looking for something that is a store of value. That is portable. That everyone will recognize as valuable. And, something that will KEEP its value. If you HAVEN’T seen all the reasons why Gold and Silver are a good idea, I strongly urge you to look through the articles in the Gold and Silver category on my other website, omegashock.com. There are some great resources there. You’ve heard the horror stories about FDR and the gold confiscation. You’ve heard the high priests of investment preach against the heresy of buying precious metals. Even your neighbor and the kid who mows your lawn are against the idea of gold. Doesn’t that maybe tell you something? Please remember that we are in this situation because we chose to ignore the lessons of history and listen to the liars who lied to us. Every currency that lost its gold or silver foundation failed within 40 years. Would you believe that it has been just over 40 years since the US dollar lost its heart of gold? And, that fear of confiscation? Back then, lots of people owned gold, and FDR knew that he couldn’t devalue the dollar unless he could get his hands on everyone’s gold. Now, the situation is different. There’s no gold connected to the dollar, so it can be freely devalued. So, there should be no immediate fear of confiscation. But, should the government choose to take your gold, I personally believe that you’ll be able to see it coming and switch to something else. Those of you who are still afraid of gold, should try silver. It is cheaper. It has awesome fundamentals supporting it as a store of value. Most of it has been consumed by the electronics industry, and continues to be consumed. And, it’s price has suffered even more manipulation than gold, so it should rise much faster than gold – when the financial crash wipes out the manipulators. For centuries, about 10 to 20 ounces of silver would buy one ounce of gold. Today, it takes more than 60 ounces of silver to buy that ounce of gold, and there is less silver in the world today, than at any other time in the last hundred years. You can bet that the price of silver is going to return to a 20-to-1 ratio. So, silver is an AWESOME idea. Except… well… if you’ve got lots of money… that much silver is hard to lug around. Seriously, that is the only downside to silver – luggable-ness. This idea is important, so let me talk about it some more. I received an email from someone that got me thinking about coins vs bars and silver vs gold – and talking to your neighbors. All of this is pretty heavy stuff – in some cases, literally. And, we jump into all of it with a great degree of trepidation. I mean, do we REALLY understand what we’re getting into? There really is a lot that we don’t understand, so we have to take a lot on faith as we decide to prepare for an uncertain future. In fact, I’m here to tell you that I myself approach all this with a great deal of fear – the fear of leading you astray. Could I be wrong about all this? Yes, I could be wrong, but the chance of that is pretty slim. As I look around at the insanity of what is going on in our world, I cannot imagine how everything could work out in the way that the talking heads of the mainstream media seem to imply. So, let’s talk about one of the few, sane options that you and I have. A friend of mine was leaving Taiwan for the US, so I bought him a 10 oz. bar of silver. And, I was amazed at how heavy it was. That chunk of metal had some serious heft to it. And, that made me realize that you wouldn’t be able to get very far, if you put any serious amount of money into silver, and then had to run for the hills with it in your backpack. If the price of silver was $20/ounce, just $29,166.85 would buy over 100 pounds. Can you carry 100 pounds? I might be able to lift it, but I wouldn’t get very far with it. So, if I plan on bugging out when everything falls apart, I wouldn’t be able to buy very much silver. However, since I plan on sticking around (i.e., ‘bugging in’) in a collapse situation, I can buy a whole lot more silver. Those of you with full and heavy ‘bug-out bags’ will still want some silver. Trading a gold coin for a bag of groceries doesn’t sound like a good bargain to me. A silver coin would be a much better deal. But wait. Is that the only reason why I am so interested in silver? Would you believe that I like silver because I’m stingy? I don’t like paying full price for ANYTHING. Everything is better when it’s on sale. And, right now, silver is at ‘bargain-basement’ and ‘firesale’ prices. I mean, silver is probably the best deal on the planet. AND THROW LOTS OF NUMBERS AT YOU! The price of silver is manipulated. And, it’s been manipulated since the beginning of the Industrial Revolution in the 1870s. Well, industry needs silver. Lots of it, so they want to keep the price of silver as low as possible. But, the manipulators have a problem. They’re running out of silver, and the demand for silver is going to take off. But, lets talk a little bit about the uses of silver before going on. All of that is pretty cool, right? But, here’s the bottom line. Over half of all the silver being pulled out of the ground is consumed (you saw that right, CONSUMED) by industry. And, by comparison, only about 10% of gold is used by industry. (However, gold doesn’t get consumed since it is virtually inert – meaning that you can almost always get it back.) Okay, so hold onto that fact, because I’m about to throw another bit of information at you. There are currently 8.52 ounces of silver mined for every ounce of gold. But, wait. We know that about half of all silver is consumed (never to be seen again) by industry – while just 10% of gold is used (not consumed) by industry. So, what’s the proper ratio? Do you think that industry is going to stop consuming silver, just because there has been a decline in silver production? Nope. They’re going to keep consuming it. 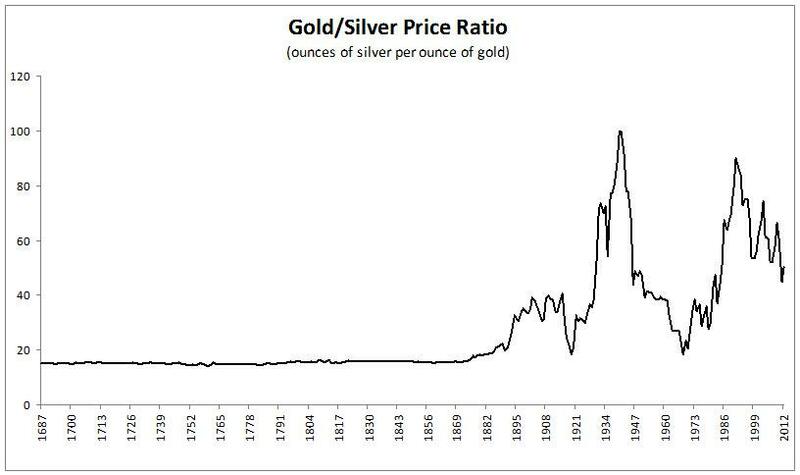 And, this is an important thing to remember because it points to a decline in the supply of silver – long term. …what does a decline in supply do to the price of something? A decline in supply forces the price to go up. This means that silver has a much brighter future that gold. In fact, it is even possible for silver one day… in the very long term future …for silver to be more valuable than gold. But, let’s get back to the hard numbers. Remember that graph that I showed you? …do you think that this ratio is going to continue? …what the proper ratio is going to be? Remember that before the Industrial Revolution, that ratio was 16-to-1. What would the price of silver be right now at that ratio? Today? But, wait a second. The price of gold is being manipulated HORRIBLY! So, what’s the proper price of gold? …what would the fair price of gold need to be set at, to make such a transaction possible? Well, let’s see, there are… wait… determining how much gold there is in the world is incredibly difficult – partly, because so many people are hiding it. The World Gold Council says that there are 174,100 metric tons of gold above ground, as of 2012. The Gold Standard Institute says that there are between 1.2 to 2.5 MILLION metric tons of gold in the world above ground. I’m suspicious of BOTH the World Gold Council and the Gold Standard Institute. The World Gold Council would like to calculate as low a number as possible because it supports a high valuation for gold. The Gold Standard Institute would like to calculate as high a number because this supports their argument for a more ‘liquid’ gold standard for currency. There are 32,150.7466 troy ounces in a metric ton – or, 32,151 troy ounces. Multiply 32,151 by 1,000,000 (1 million), and you get a figure of 32,151,000,000, or 32.151 billion troy ounces of gold. Again, that’s all the gold that has ever been mined in all the history of the world – and hidden away in secret vaults. But, you’re only going to get that figure if you raided all the vaults in all the world – assuming that the ‘Gold Standard Institute’ was calculating everything properly. That’s quite a difference, and one day we’ll know which is the true figure. When the price of gold goes up, more and more of the gold hidden away in secret vaults will start to see the ‘light of day’. Oh, and let’s not forget that the COST of mining gold is going up… and Up… and UP! But, let’s get back to figuring out a ‘reasonable price’ for silver in the future. The current price of silver is $19.18 per troy ounce, or one eighth the price. Will we ever see those kinds of prices? It’s more useful for everyday life, like buying food and fuel. It has an incredibly bright future. The only downside is that it’s difficult to carry around. So, buy as much silver as you can carry. And, if you expect to ‘shelter in place’ when things fall apart… well, take all of your money and buy silver. Seriously, get lots and lots. But, all of this is a calculation that only you can make. Please remember that we aren’t trying to make a fortune here. What we’re trying to do is lay the foundation for your survival so that you can continue doing the job that God called you to do. We all have a purpose for being on this planet, and our job is to continue fulfilling that purpose until the Lord calls us home. And, survival may mean relocation on short notice, and you might not be able to take anything more than what you can carry on your back. Remember what I said about how much $30,000 of silver weighs? Yeah, it’s more than a hundred pounds. Do you want to carry all that in your backpack? Take it with you on an airplane? By comparison, that same $30,000 will buy you less than two pounds of gold. So, figure out the proper ratio, and then buy as much gold as you can with the money left over (after you have invested in all the other survival essentials). Please remember that a gold coin may one day save your life. Those fleeing Nazi Germany were able to use gold to get past checkpoints and onto trains and ships that carried them (or just their children) to freedom. You might one day be forced into such a situation. So, think about that as you make your calculations. Get as close to God as you can. Only HE can see you through. Prepare for physical needs – food, water, shelter, etc. Buy as much gold as you can afford. Do NOT tell ANYONE about your preparations. Do not tell them about your silver. Do not tell them about your gold. Do not tell them about how much food, water, etc. that you have. That means family, neighbors or even church members. Please only share this information with people you ABSOLUTELY trust. And, when I say ‘absolute’, I mean that you would trust them with your life and the lives of your family. Does that make it hard to talk about preparation? Yes, so please feel free to pass this article around, along with any other article that you see on this website. Well, I stopped being a skeptic when I realized the danger of our current situation. We are in it deep, and sinking fast. If we are to have ANY future, we must check out of the fake financial system, and get into something real. Now, that doesn’t need to be precious metals. It could be anything like farmland, copper ingots, or really pretty rocks. If you have special knowledge in such areas, and feel that it would hold value in the midst of chaos… go for it. My own knowledge is pretty much limited to the Bible, finance, technology and war. So, don’t take my silver recommendation as gospel truth. In fact, take EVERYTHING that I say to the Lord in prayer. There’s no hope for any of us without God’s direction. But, why do I call silver a miracle metal? Never in the history of mankind have we consumed so much silver. And, when I say ‘consume’, it literally is being devoured by industry. Very little of the silver that we use to produce our electronics, solar panels and other products is recoverable. This means that it is disappearing. Did you know that there is ten times more gold in the world, than silver? It used to be the other way around. Compare that with the five BILLION ounces of gold in precious metals inventories, and you see that silver is… interesting. The question, of course, is all about WHEN. Well, that shouldn’t matter to you. The time to prepare is NOW. If you have extra cash on hand, and your bills are covered, go out and buy silver. We don’t know when the price of silver will stop being manipulated. So NOW is the time to buy silver. Not tomorrow, or the next day. Who should you buy it from? I asked my Omega Shock readers to share with me the names of those Christians that they know who deal in precious metals, and I got some great comments in return. So, here are the dealers that many of you told me about. Again, please leave a comment and tell us about a Christian dealer in precious metals that you personally know. I would be more than happy to add to the list. So, you have four gold and silver dealers to choose from. Now, go out there and get some silver. I’ve thrown a lot at you in this section, so let me remind you of the four points that you MUST remember. Draw close to God – HE is the One who will save you in the coming days, months and years. If you have been holding out on God (and we all do), stop now. Get back your faith. Walk with Him. He will never fail you. Get your money OUT – I don’t care what you have to pay or do, but get your money into your own hands. Otherwise, it WILL disappear. This is guaranteed. And, good servants of God seek to walk wisely and preserve what God has entrusted to them. Get something of value – It doesn’t matter what it is, as long as it fits with your survival plan. Seriously, you need to get to the other side of the coming disaster so that you can be in a position to serve God. Get something of value that will help you stay alive… that you can use to help others stay alive. Gold and Silver – When I was a financial adviser in the ’90s, it was the dumbest idea in the world. Now it’s not. Buy as much silver as you can carry. Then, buy gold. I hope that what I’ve written here helps you. I earnestly pray for you all.